This month at The Gourmet Chocolate of the Month Club™ we are truly thrilled to bring you a new chocolatier from Toronto, Ontario, Canada: Chocolate Signatures. Founded in 2011, Chocolate Signatures is actually two chocolatiers in one: Dufflet Small Indulgences and David’s Fine Belgian Chocolates. Open seven days a week, Dufflet’s Pastries on Queen Street West is the only place to go in Toronto, Canada for light lunches, gourmet coffee, and of course, succulent desserts. Owned by the legendary Dufflet (duf-let) Rosenberg, affectionately known as the ‘Queen of Cake’, the business now has a few different locations around Toronto, and her wholesale division provides an ever-changing selection of over 100 items to over 500 restaurants, cafés, hotels, caterers, grocers, and specialty gourmet shops throughout Canada and the United States. Dufflet got her start in 1975 by baking desserts out of her own home kitchen for the then legendary Cow Café. She was an instant success and in 1980 opened her first bakery on Queen Street West, which soon evolved into a café after a couple of years. Soon, restaurants, hotels, and cafés were lining up to place orders for her one-of-a-kind desserts. Wanting to meet the demand, Dufflet moved the production to a second location that was 5,000 square feet in 1985, but nearly doubled in size during a major overhaul of the space in 2001. Over the next several years, Dufflet opened two more retail locations in Toronto: one in the historic North Toronto neighborhood and another in the Beach neighborhood. Bridging European traditions with a modern approach and with the promise of “Pure and Sweet” is what makes her creations in such high demand. Everything Dufflet makes, from pies, cakes, cookies, chocolates, and more, is handmade from scratch (no mix here!) from the highest quality and all natural ingredients – making sure that there are no hydrogenated fats, oils, artificial flavors, colors, or preservatives. David’s began in 1991 as a chocolate company that made truffles by hand with Belgian chocolate and classic chocolatier techniques, and they are now found internationally in gourmet food retailers and traditional chocolate shops. Today, the David’s brand includes inspiration from childhood memories and fun flavor combinations ranging from Caramel Pretzel Squares to PB&J Bites. Many of the David’s confections are still hand made with the care and tradition that began with their original truffles while using only the best ingredients possible. Winner of a silver sofi™ award for their dark chocolate covered sponge toffee, David’s Fine Belgian Chocolates offers everyday indulgences to whimsical seasonal chocolates to delight the young at heart. In 2011, Dufflet Small Indulgences and David’s Fine Belgian Chocolates joined forces and with an unrelenting focus on creative innovation, quality ingredients, award winning products, and impactful design they created Chocolate Signatures. Together, they have over 55 years of experience in the world of confections and pastries. Your shipment today has a variety of unique confections that have been created by each chocolatier and are playful and sure to bring back some childhood memories! Chocolate is exceptional high-energy food relative to its small volume. It is considered a food that promotes effort whether intellectual or physical. Chocolate’s chemical composition includes carbohydrates (starch, diverse sugars), fats (cocoa butter), and vegetable proteins. Minerals can also be found in chocolate: potassium and magnesium in large amounts, calcium and sodium in small amounts, and iron in trace amounts. Chocolate also contains vitamins A1, B1, B2, D, and E.
The pleasure derived from chocolate is believed to stimulate the secretion of endorphins, natural opiates. At least five pharmaco-dynamic (producing reactions in humans) substances are found in small amounts: Theobromine, Caffeine, Phenylethylamine, Anandamide and Serotonin. Theobromine stimulates the central nervous system and the appetite, facilitates muscular activity, and has diuretic and cardiotonic effects. Caffeine increases resistance to fatigue, enhances intellectual activity, and increases watchfulness. The amount of caffeine in one average chocolate bar is about a third of the caffeine in a cup of coffee. Phenylethylamine has a chemical structure similar to amphetamines and contains psycho-stimulating properties. Chocolate contains the highest concentration in any food of phenylethylamine, which is a chemical produced in the brain when a person is in love. Phenylethylamine combines with dopamine to produce a mild antidepressant effect. All of these stimulants increase the activity of neurotransmitters (brain chemicals) in parts of the brain that control our ability to pay attention and stay alert. Serotonin is a neurotransmitter (a substance used by neurons to communicate) in the cerebral cortex. Its quantity is often found to be lower during certain nervous depression states. The serotonin found in chocolate helps correct its initial loss. Caffeine and saccharose stimulate the body's stimulation of serotonin. Anandamide also affects brain chemistry to produce feelings of calm and well being. The effect is quite small but noticeable. Research has proven that when people strongly crave chocolate, low-quality candy won't fix the craving. Very high fat, dark chocolate which transports plenty of cannabinoid cousins, along with natural opiate inducing cocoa butter is what they crave. 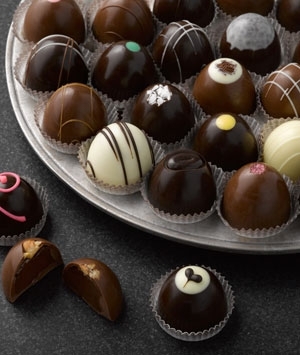 Like fine wines, chocolates should be stored in a cool, dry, and dark area. Since chocolate is highly susceptible to absorbing odors, your chocolates should be kept away from other strongly fragrant foods. 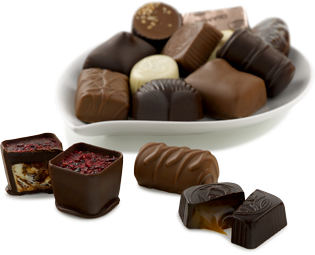 Optimally, you should store chocolates at 59° to 65°F (15° to 18°C), and under 65% humidity. If you keep them in an ambient temperature below 72°F (21°C), there is no need to refrigerate your chocolates if they will be eaten within three weeks. Let's face it, these chocolates will most likely be eaten within three days! You may need to hide them if you want them to last three weeks! So what are you waiting for? Chocolate Signatures beckons!